We still have some ice along the shoreline. And Smelting has not yet begun. We’ve had the rain to diminish the ice and now we need wind to blow it out. It’s all up to Mother Nature so we have no idea when the run will start but as soon as we hear it has started we will post it. Anglers All, located at 2803 E. Lake Shore Drive (U.S. Highway 2) in Ashland, is a full-service tackle and fly shop offering a huge selection of baits and tackle for year-round fishing. For the most complete and up-to-date fishing report, just give them a call at 715/682-5754, and they will gladly keep you informed! Carolyn from Anglers All reports: At this time there are fish being caught in the Tributary Streams. However, the water is still a little high and dirty. The Bay is starting to open up; but at this point all of the landings are still iced in. River Rock Inn & Bait Shop, located at 1200 W. Lake Shore Drive (U.S. Highway 2), in Ashland where you can stop in and see their wide variety of live bait, fishing tackle, gear, accessories, fresh and smoked fish from Lake Superior, local meat sticks, and microbrews, and much more. Call them at 715/682-3232 for the most current fishing report. Scott Bretting reports: We are starting to see open water but the boat landings are still iced in. At this time we are still a couple of weeks out for Smelt season to begin. They are hearing that there have been fish caught on the Sioux, including a few nice Steelheads but reports have been limited. It’s still very early and there is a lot of snow in the woods. Fish Creek is still cloudy and high, making it difficult to fish. River Rock Inn & Bait Shop Live Cam – Hot pond area. Make sure you click the link once in the page. 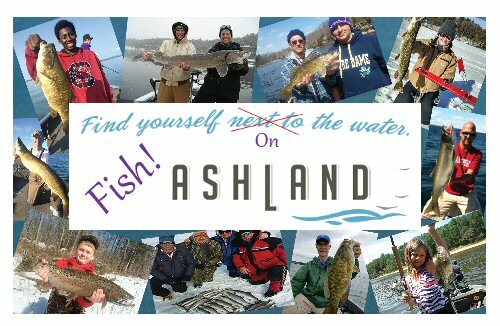 The Ashland Area Chamber of Commerce, 1-800-284-9484, reports: Fishing is always a thrilling adventure in the Ashland area! Chequamegon Bay is famous for its world-class smallmouth bass fishing. The 12-mile-long bay’s rock piles and breakwater structures make for perfect bass habitat. Wisconsin residents and non-residents 16 years of age and up will need a fishing license to fish any waters in the state. An annual license costs $20. Go online at http://dnr.wi.gov/topic/fishing/regulations/hookline.html for more details. Residents born before Jan. 1, 1927, don’t need a fishing license. They do need to carry proof of their age when fishing, however. State residents who are members of the U.S. Armed Forces on active duty are entitled to obtain a free license when they go on furlough or leave. Motor trolling is now legal on all inland waters with one hook, bait, or lure and – depending on location – with up to three hooks, baits, or lures, according to the DNR website. Most inland lakes and rivers within the Ceded Territory (which includes Ashland County) have a daily bag limit of 3 walleye. ALSO – To see a real-time image of Chequamegon Bay, go to Northern State Bank‘s Bay Cam. And be sure to check out River Rock Inn & Bait Shop‘s new, awesome Live Cam overlooking the area near the Xcel Energy “hot pond”! 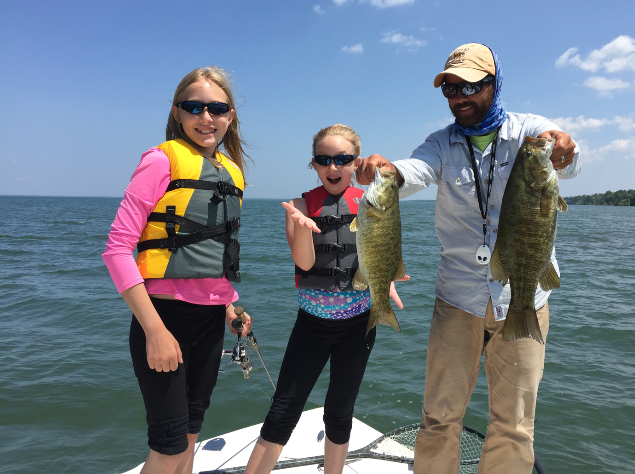 Check out this wonderful article by Andrew Ragas of NorthwoodsBass.com about the excellent smallmouth bass fishery right here in Chequamegon Bay! Ragas spent a day out on the water with Ashland native Nate Baron of Up North Guide Service. Read about Roger LaPenter’s 2014 induction into the Fresh Water Fishing Hall of Fame. 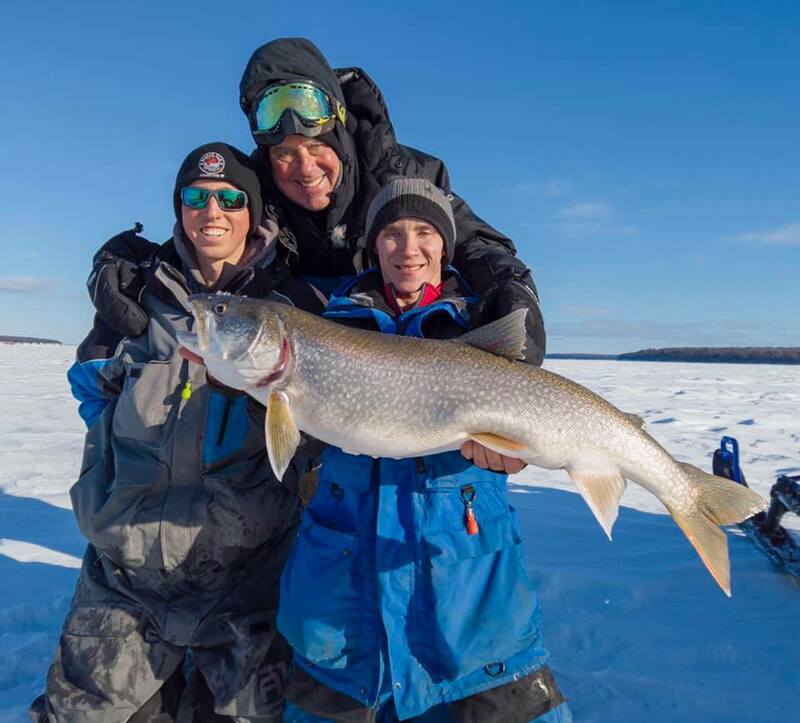 Learn more about the great fishing in Chequamegon Bay!